Acrolein is a molecule formed from the heating of all three macronutrients (fat, carbohydrate, and amino acids in protein). It also naturally occurs in fruits, vegetables, fish, and cheese, and is detectable in spirits and wines. Acrolein is also used as an herbicide, primarily against weeds found in water canals. Acrolein may cause damage to cells, including the lesion of mucous membranes when it comes in contact with the tissue. Systemic effects have not been found in animal studies. Acrolein is also produced within the body and has been associated with neurodegenerative diseases. This information has prompted some to encourage reducing external sources of acrolein, keeping total intake and possible effects minimized. Acrolein easily evaporates at normal temperatures and so it is difficult to establish exact levels within foods. 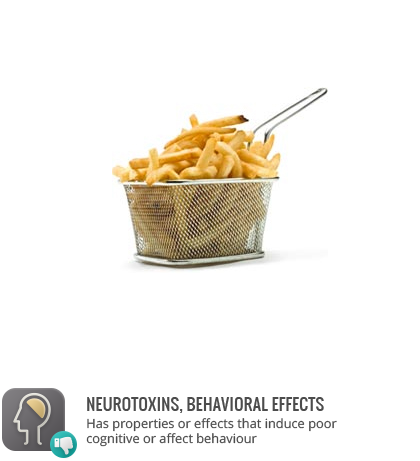 Certain food preparation methods, such as frying, produce greater acrolein content in general.